The Treaty of Brest-Litovsk signed between Germany and Bolshevik Russia in March 1918, permitted German and Austrian troops to enter independent Ukraine at the invitation of the Ukrainian government. Without their presence, Ukraine would have quickly fallen to the Bolsheviks - and after the Germans and Austrians left at the end of 1918, it did. The town of Homel - Gomel in Russian - in Mogilev guberniya was a major military centre for the German Occupation. Not having any fighting to do, the soldiers turned their attention to philately - as soldiers did in those days. It was a way of passing the time and making money. Nowadays, they would probably do other drugs. More puzzling are the bogus types numbered 3, 4 and 5 by Dr Ceresa and known as the "Homel - Townsend" types. Type 3 is illustrated in Row 2, type 4 in Row 4 and Type 5 in the bottom row. 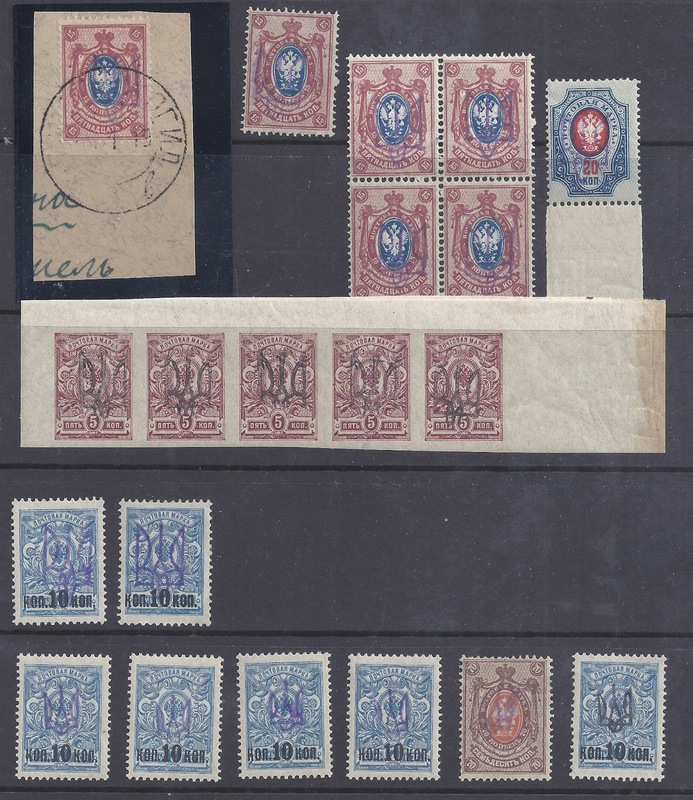 These stamps first turned up in England and were catalogued as early as 1920 which makes them more interesting than if they had turned up in 1990. Today, they are not easy to find though perhaps most of those that exist are still in England. They were supposedly brought to England by a Captain Townsend who claimed to have bought them at post offices in the Homel area. No one seems to have pointed out that this is a strange story. Until the end of 1918 the Homel district was occupied by German troops and an English officer could not have been wandering around the post offices. After the Armistice of 11 11 1918, the Germans withdrew and fighting between Ukrainian National Republic forces and Bolshevik forces shortly began. Again, no place there for a British officer ( I don't think the British ever had a Military Mission to the Ukrainian National Republic - that would be the only way for a Captain Townsend to be free to go around collecting stamps at the end of 1918). Anyway ... everyone now agrees that the Homel types 3, 4 and 5 were private productions made no later than 1920 and quite possibly made in Ukraine - but where and by whom we do not really know. Captain Townsend is no longer alive to tell us.